Legal opinions - a Sales Manager's best friend! The issue boils down to time-tracking and payment for overtime. In short, nonexempt employees are entitled to overtime pay. Exempt employees are not. Here's an explanation from Hopkins & Carley, a Silicon Valley legal firm. (c) work in the “retail and service industry." Employers are engaged in the “retail and service industry” within the meaning of the Fair Labor Standards Act if they derive at least 75% of their annual sales revenue from goods or services not for resale and are recognized as a retail or service establishment in their industry. The FLSA contains an exemption from the payment of both minimum wage and overtime pay to any employee employed as an Outside Sales Employee, as that term is defined by the Regulations, Part 541. Further, this may or may not be contradicted by local, state laws. Home offices may or may not be considered an employer’s place of business. Draws may count as commission, or may count as salary. 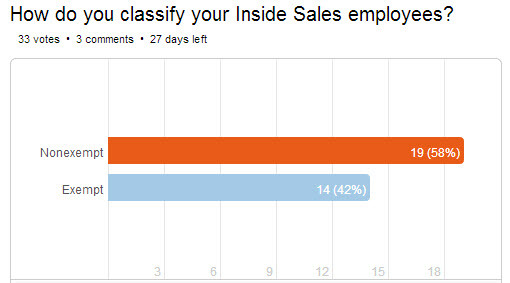 Treating inside sales as non-exempt is the leading approach – but not decisively. I will tell you, that those who classify as non-exempt have communicated quite a number of challenges. Culture – Is there a different ‘feel’ between being an hourly vs. salaried sales person? If an organization has both field and inside sales and they both carry significant quota but are paid differently, does it result in a culture clash? Competitive hiring – In this crazy climate for hiring inside sales people, if a great rep is looking at two opportunities and one is hourly and the other salary, they tend to select the salary position. Does hourly carry a stigma? Overtime – Non-exempt requires the payment of overtime. So, do reps “punch” in and out? What about remote workers? Since they are not in the office, per se, are they then exempt? Flexibility – Many organizations have taken flex time to a whole new level. They offer bonus vacation time as long as you are making your number. Well, if that means you work 70 hours one week and none the next what does that do to the equation? I think we can all agree that this is a 'challenging' issue. Common sense is not in play here (my personal opinion). So what say you? When commenting please feel free to do so anonymously if you so desire. No one needs to know which way your company went on this issue - unless you want them to of course.